If you are willing to follow an old Slovak custom, this month may start very well for you. The condition is to kiss your beloved on May 1st under the blossoming cherry-tree. There are no instructions about what to do if there is no such a tree in sight. However, we may assume that the most important thing is to have a loving person willing to look for such a romantic place with you. If you succeed, legend says that you will be happy with your love for the whole year. The second Slovak May custom, you can only observe. It came from the times when young boys wanted to be sure that their object of love belonged only to them, so they decided to make a really visible mark in front of the girl’s house. Thus, in years past, in front of almost every house where a young man’s lover dwelt, a big fir (pruned of the branches except the very top and decorated with long colorful ribbons) stood for the whole month of May. Well, being marked in such a tangibly solid way, it was pretty hard to deny that you had slept with the loving builder of this „máj“ pole. These days you still may see these symbols of love, but mostly just one for the whole village. It seems that the right to privacy applies in the Slovak countryside too. This month is called in Slovakia „the month of love“, but we have also a saying that „love comes through stomach“. And precisely in May you should try an original Slovak delicacy – „májová bryndza“. Translating the name of this specialty into English is not easy. If you are lucky you may buy it in Great Britain under the name „Carpathian cheese” and in USA sometimes under the commercial name “Liptova“, because this sheep (rarely also cow) cream cheese is produced mainly in the Slovak region called Liptov. „Bryndza“ is also an essential part of the Slovak national meal „halušky“ (dumplings with „bryndza“ and roasted bits of bacon on top) that can be made up to eleven different ways – from sour to sweet ones. But there is only one „májová bryndza“, and it is served alone with choppings of chives for decoration. In combination with „žinčica“ (sort of „sheep’s cheese milk“) it is healthy, but an untrained consumer might be surprised by the high speed he can attain in order to reach as soon as possible that small room where we love to be alone. However, there is a solution. “Žinčica” can by purchased at the sheep farms called “salaš” situated mostly on the slopes of the Slovak hills. Walking in our northern hills is a rewarding experience, especially in May. 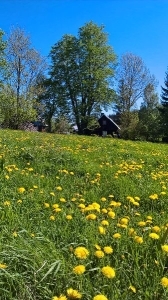 The meadows are full of dandelions, like natural carpet of gold. Some fields are choked with crocuses. This part of the country becomes violet, romantic haze. But don’t be surprised – by walking through the north part of Slovakia, Orava – if all this beauty is suddenly covered by late snowfall. As in love, colorful moments can be frozen for a moment by misunderstanding, and then the sun of the month of love shines again.